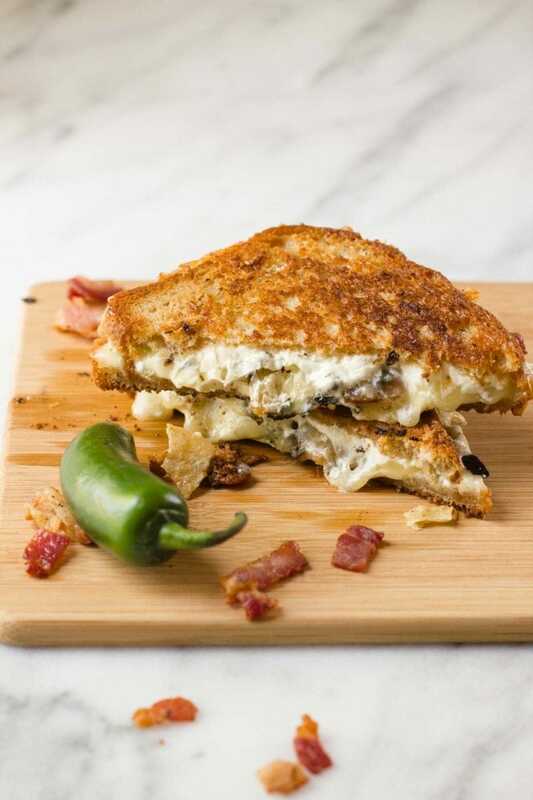 Roasting the peppers helps mellow the spice and make this Jalapeño Popper Grilled Cheese the perfect (slightly spicy) comfort food! We have an ongoing debate in our house about grilled cheese. That’s normal right? Other families debate totally asinine things like this? Reassure me, please. Anywho, I am a purist. I believe that for a grilled cheese to truly be considered a grilled cheese, it has to be in its simplest form. Bread. Cheese. Butter. Done. My husband, on the other hand, thinks that any sandwich that happens to have melty cheese on it is considered a “grilled cheese.” No matter how much doctoring you do to it, it’s still a grilled cheese. I argue that it’s a slippery slope when you start calling any old sandwich with melted cheese a “grilled cheese.” I mean, what’s to stop people from calling a cheeseburger a “grilled cheese with beef.” Chaos. CHAOS, I SAY. Words mean something, people! I have been a simple grilled cheese evangelical for a few years now, and honestly, I’ll spew my rhetoric to anyone who will listen (which, really, isn’t many). I can be quite stubborn, actually. And then I started working on this little recipe here, and something changed. I got a few loaves of the amazing White Bread Done Right from my friends at Dave’s Killer Bread (more on them in a sec), and the first thing I wanted to make with it was grilled cheese—so I did. A “me” grilled cheese. Bread. Cheese. Butter. And it was Awe. Some. White Bread Done Right is like everything I’ve ever wanted in a bread. It’s fluffy, light, and airy like white bread, but all the whole grains and nutrition of one of the whole grain cardboard-like breads from the grocery store. It’s perfect for grilled cheese (and French toast, too). This is whole grain bread that even whole grain bread haters will love. This bread is so good that it actually made me want to doctor up my classic grilled cheese. Like I owed it to this bread to bring my A-game. Man, I’m really showing you guys just how strange I am today, aren’t I? 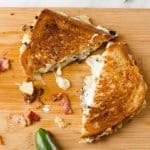 So I started thinking about what bugged me about fancy/doctored/not-pure grilled cheeses, and I realized it was all about the focus of the sandwich. I believe the focus of a grilled cheese should be, you guessed it, the gooey, melty cheese (and good bread, of course). 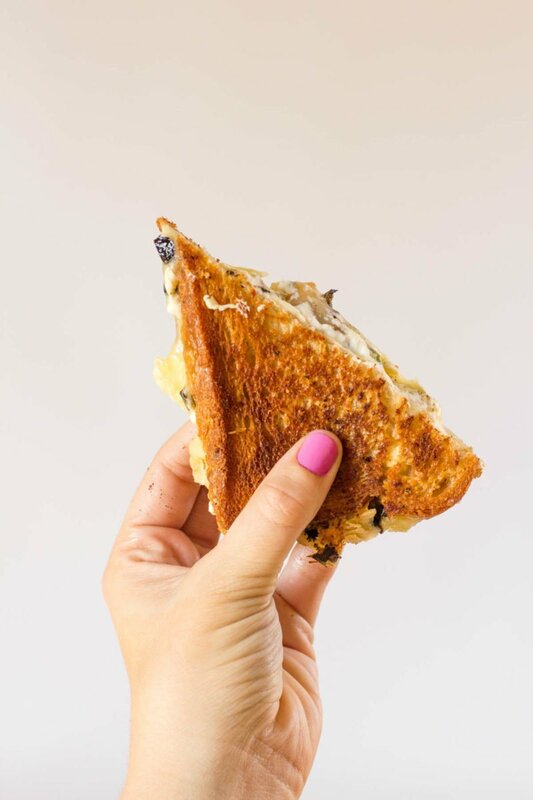 If that’s still the focus of your sandwich, even if you doctor it up, then I think I can get on board with calling your sandwich a “grilled cheese.” And so that’s why I’m calling this totally doctored up, totally fancy, totally not pure sandwich a grilled cheese. Because even though it’s full of jalapeños and bacon, it’s still all about the cheese. Did you see me just rationalize away my principles? Boom. Now I’ve taken you on the enchanted voyage through my thought process, let’s talk about this sandwich. Take the best jalapeño popper you’ve ever had and combine it with the best grilled cheese sandwich you’ve ever had, and you get this jalapeño popper grilled cheese. It’s super gooey, it’s a tiny bit spicy, it’s salty from the bacon, it’s crispy from a secret ingredient, and the whole thing is cooked in bacon grease. It’s, truthfully, incredible. I know you’re probably thinking it is also spicy as all get out—after all, I call for a whole jalapeño for each grilled cheese sandwich. But actually, it’s pretty tame. 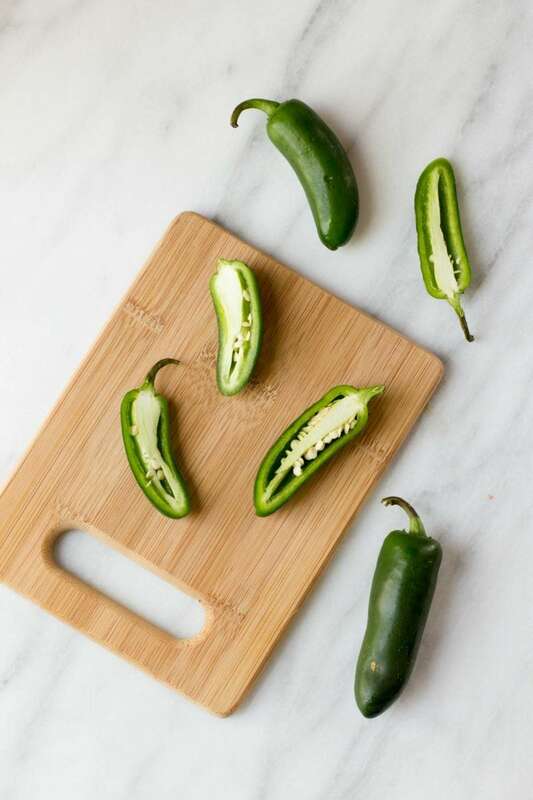 To mellow the spice in jalapeños, the recipe has you roast them in a hot oven first. The heat brings out the sweetness of the peppers and milds the spice. If you like it a bit spicier, just keep the seeds and membranes intact in your jalapeños, or even skip the roasting step completely if you really like the heat. This jalapeño popper grilled cheese is the first of a whole bunch of recipes I’ll be teaming up with Dave’s Killer Bread to bring you over the rest of the year. I am so excited to bring them on board to the Wholefully family! They are an incredible company with an awesome mission, and they make some seriously amazing products. All of their bread is organic, non-GMO, packed with whole grains, and tasty as all get out. And their company is committed to Second Chance Employment—one-third of their employees have a criminal background. You can learn more about their Second Chance Employment program in this video. I am just so proud to be partnering with Dave’s Killer Bread this year. If you want to track down your own loaf of White Bread Done Right (or any of their varieties), you can check out their store locator to find a retailer near you. Enjoy! Meanwhile, cook the bacon in a heavy-bottom skillet (I recommend a cast iron skillet) over medium-high heat until crisp. Remove from pan, reserving the bacon grease in the pan. Crumble bacon and set aside. Melt the butter in the skillet with the bacon grease. Spread half of the cream cheese over one side of one slice of the bread. Place in the skillet, cream cheese side up. Then sprinkle with half of the Monterey jack cheese. Sprinkle on the roasted jalapeño, the bacon, and the tortilla chips. Then top with the remaining Monterey jack cheese. Spread the remaining half of the cream cheese over one side of the second slice of bread. Place it, cream cheese side down, on top of the sandwich. Press sandwich firmly with a spatula. Cook for 6-7 minutes, or until the cheese begins to melt and the bread is brown and crunchy, then flip and cook an additional 4-5 minutes. Serve immediately. Always use gloves when handling hot peppers. Jalapeños can vary greatly in heat level. Fresh jalapeños are milder than older ones. Peppers with smooth, uniform skin will be milder. If you see a pepper that is bumpy, lumpy, or has variations in the skin, it will probably be spicier. Roasting the peppers will balance out some of this heat variation, but not all of it. I’d recommend tasting the pepper before putting it on the sandwich just to make sure you didn’t pick up a scorcher! This is a sponsored post written by me on behalf of Dave’s Killer Bread. All opinions are entirely my own. 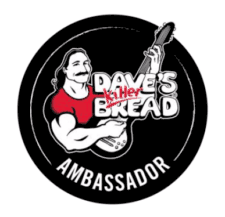 Learn more about Dave’s Killer Bread by visiting their website or joining the BreadHead Nation on Twitter, Facebook, YouTube, orInstagram. Well, with apologies to your husband, you are right about grilled cheese. But I just can’t get on board with chili being called a soup. If anything, it is more like a stew. But really it’s just chili, in its own category, as your man says. So there. I agreed with both of you..
Hope you are healing from your fall! But if you HAD to put chili in a category, where would you put it? Like say, for example, you are organizing a cookbook into course-related sections—you wouldn’t just have a “chili” section would you? Wouldn’t it go with soups? Chili n’ grilled cheese is a match made in heaven, grilled cheese is a bare canvas like chili, you can paint or build it any ol’ way ya wunna..Now on the debate of whether chili is a soup or a stew well, out here on the western plains I’ve been known to put black bean, pinto, kidney with ground turkey in my crockpot chili but, in Texas if you just park a can of beans near their so-called chili you’ll be hung by the nearest tree or burnt at the stake with a pile of mesquite bush, I actually think it’s a felony to put beans in chili in Texas. To me that’s just a chili sauce to slather on hot dogs, right? Adios n’ Hasta La Bye Bye L.D. Now, I’m more of a grilled cheese and tomato soup kinda gal. I serve my chili with noodles, cheese, crackers, and sour cream! :) And I often put THREE kinds of beans in my chili. Texas would hate me. I’m somewhere between you both. If the main ingredient is cheese and you add elements to kick it up a notch (bacon, prosciutto, sundried tomatoes, carmalized onion, basil, etc) than I consider it a fancy (and delicious!) grilled cheese. But if there is more of the extras than there is of the cheese, it’s something else. 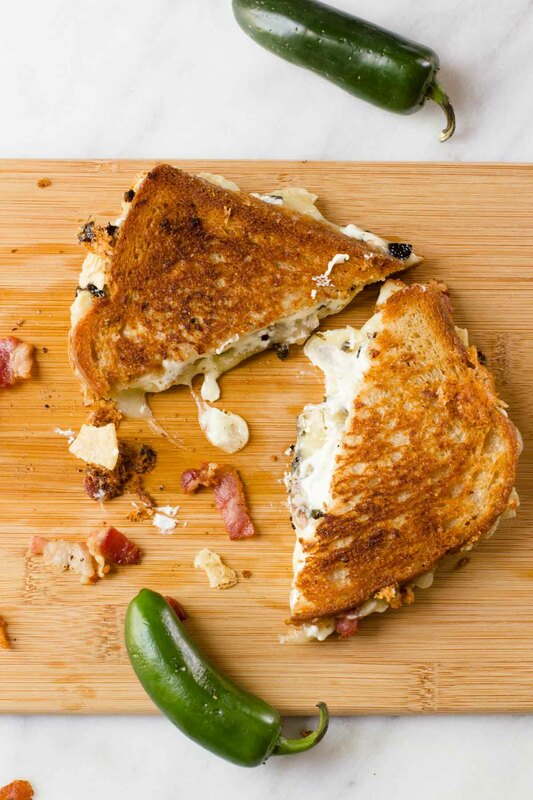 Now I really want a grilled cheese with bacon, prosciutto, sundried tomatoes, caramelized onions, and basil. Ha! I love Dave’s Killer bread! Been buying it for years. The only bread we basically eat. And the story behind it is amazing. Isn’t their story awesome? I love it, love it, love it! I tend to be a purist too but this looks amazing. 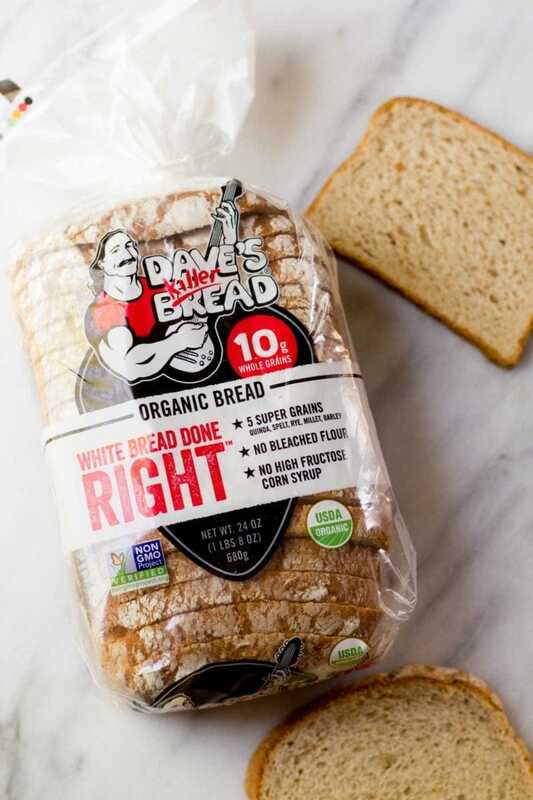 I’d never heard of Dave’s Killer Bread but I looked up where to buy it in my area and several stores have it. Can’t wait to try it! I found your blog through a pretty Pinterest pic and I’m so glad I did — you have a great blog! Beautiful pictures, and very well written – keep it up :) Looking forward to reading more of your posts! My husband is also Canadian and has the same issue of calling anything with melted cheese a “grilled cheese”…. I used pickled jalapeños instead of roasting my own…so good! Thanks for the idea! !